Male peponapis pruinosa — one of the "squash bees." Flowering plants use a variety of strategies to gain the cooperation of pollinators. For example, in the course of the nectar-gathering activities of bees, the bees transfer pollen from plant to plant, or from stamen to pistil on the same plant, fertilizing it. 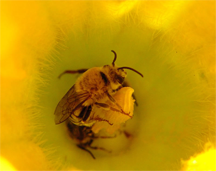 When we view this activity as an exchange, the bee receives nectar in exchange for pollination services. The exchange is guaranteed to be contemporaneous, because the bee cannot possibly gather the nectar without transferring pollen. Viewed from the perspective of stable agreements, this "deal" between the bee and the plant is well designed. Photo courtesy of U.S. Department of Agriculture Agricultural Research Service Bee Biology and Systematics Lab, reproduced by the U.S. Forest Service. When two or more parties work out their differences, they often employ explicit agreements. Written or oral, signed or unsigned, agreements spell out what will be exchanged and when, or what the parties will refrain from doing. Agreements are essential to collaborative work in the context of constrained resources. When agreements collapse spontaneously, there is no apparent external cause. Even when external conditions remain unchanged, agreements can implode. Distrust and rancor can follow, jeopardizing the possibility of future agreements. Because the long-term consequences of collapse can be more severe, unpleasant, and debilitating than the collapse itself, skill in crafting stable agreements is a valuable asset. Here are some of the attributes of stable agreements. Stable agreements are voluntary. Neither party is coerced by the other, or by any other party. For example, the supervisor who addresses toxic conflict between subordinates by ordering them to "work it out or else" is establishing conditions for an unstable agreement. If coercion drives the bargain, the agreement can remain stable only as long as the coercion remains effective. Both parties have equal access to information about the context of the agreement and the value of the items exchanged. That is, one party estimates the fairness of the agreement about as accurately as the other. Information quality asymmetry is especially troublesome when the advantaged party knows that the disadvantaged party is agreeing to an unfair exchange, or when the advantaged party intentionally misleads the disadvantaged party. When the truth finally becomes apparent, the disadvantaged party often feels harmed. Relationships degrade. The agreement collapses. coercion remains effectiveconfidential components, stability requires that there be incentives for maintaining that confidentiality. For example, when an agreement must remain confidential for delicate policy reasons, a trap awaits: the first party to disclose the agreement can sometimes shift responsibility for the need for delicacy onto the other party, even after harvesting value from the agreement. When agreements are confidential, they must address the problem of incentives for first disclosure. Perhaps the most important stabilizer of agreements is simultaneity of exchange. If one party harvests value from the agreement before the other, or faster than the other, then the earlier harvester has an incentive to renege after having harvested enough value. Such an agreement becomes a form of "I'll scratch your back; you stab me in mine." Working out contemporaneous exchanges can be difficult, sometimes requiring streams of small bits. Finding workable decompositions can require some cleverness. Would you like to see your comments posted here? rbrenUHrZDzJEwqRuvxdZner@ChacbhHXbTMODvwKOZQRoCanyon.comSend me your comments by email, or by Web form. I offer email and telephone coaching at both corporate and individual rates. Contact Rick for details at rbrenMAlEDfuSYLvIZhECner@ChacJssNfbVjqXfLOLQHoCanyon.com or (650) 787-6475, or toll-free in the continental US at (866) 378-5470.